Thanks to its flexibility, simplicity, and range, MANUAL DE GRAMÁTICA is the most accessible grammar reference for intermediate and advanced students of Spanish. It combines clear, easy-to-use charts with detailed grammar presentations in English and offers valuable conceptual distinctions between Spanish and English. Beginning with sentence structure, the text follows a logical progression of topics from parts of speech to verb tenses to the finer points of lexical variation. The text facilitates independent study. Students have the opportunity to self-correct in practice as supporting exercises are followed by answer keys. 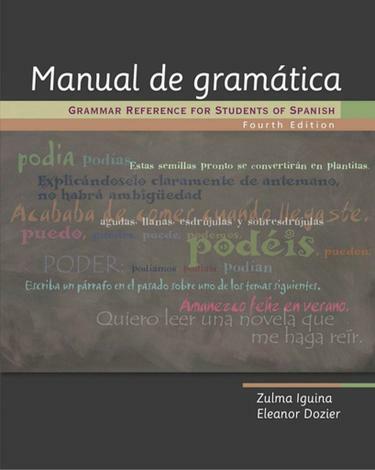 The text covers all major grammatical rules of Spanish and offers real-world applications of all grammar points, making it an invaluable reference tool for intermediate and advanced literature and language courses. The Fourth Edition includes updated examples of grammar in use. These examples, which help to clarify the traditionally most challenging grammar points, reflect contemporary language usage. New ancillary components are introduced-Heinle iRadio and iLrn: Heinle Learning Center-which offer varied approaches for teaching and learning with MANUAL DE GRAMÁTICA and broaden the appeal of the text by making it available in both print and electronic form.